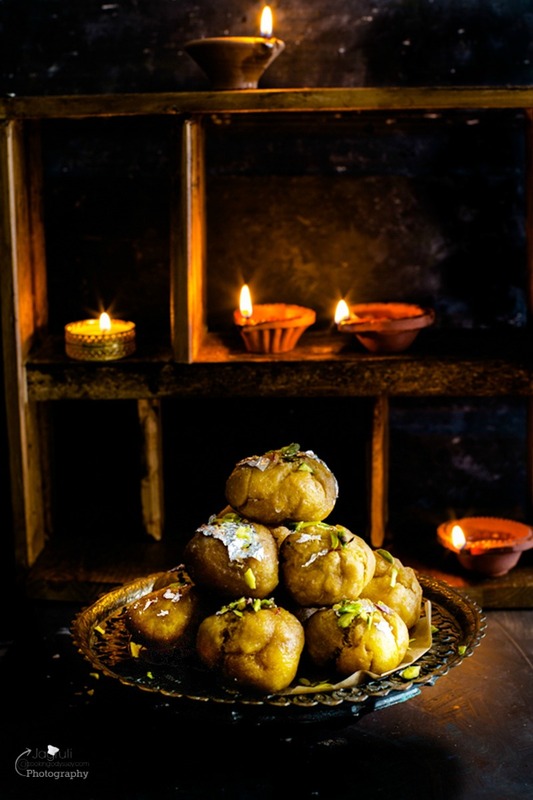 Fancy a scrumptious and delightful Diwali recipe? Stuffed Magas Ladoo, this is rich and full of goodness! 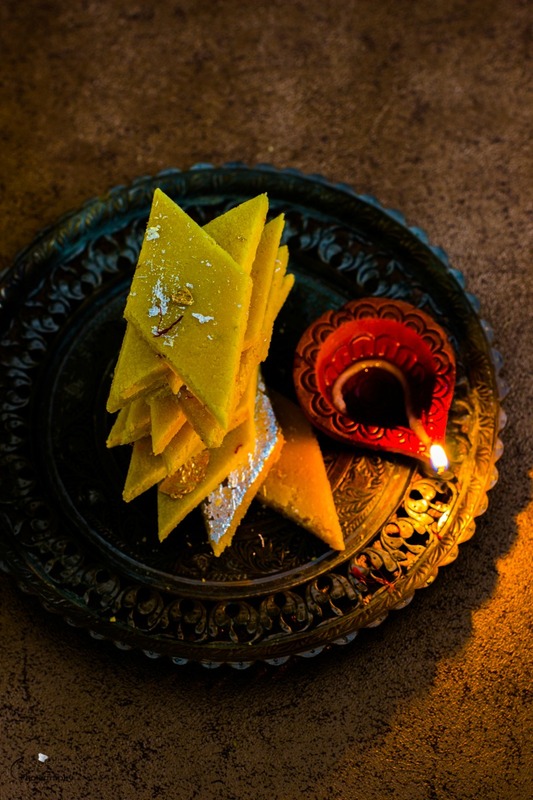 Enliven your Diwali with these aromatic and moreish. 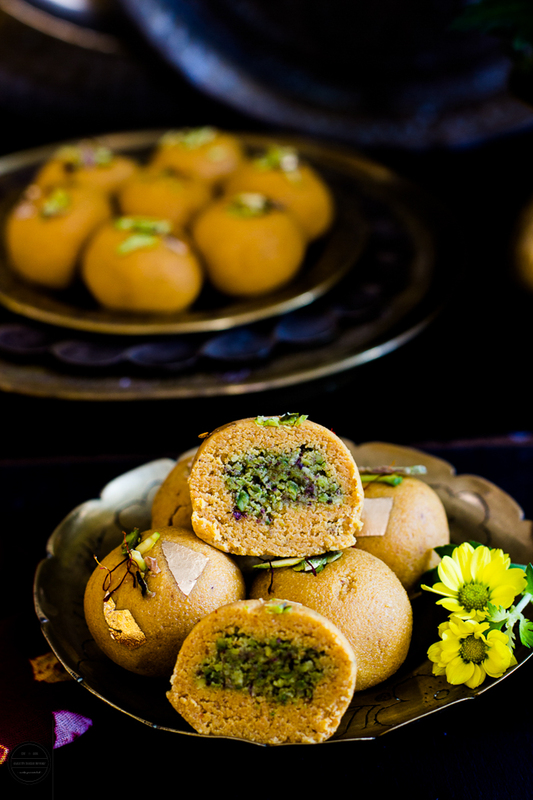 These Magas Ladoo are stuffed with rich and creamy Pistachio filling. The Festival of Lights - Diwali finally is here, it's that time of the year where you can feel the festive warmth, hues and spirit in the air. This festive season also brings with it yet another excuse to prepare and relish so many gorgeous, delectable and rich sweets, be it a traditional, modern or fusion. If you ask me what is your favourite mithai (sweet), let me tell you it would be very difficult to choose as I can relish and cherish any sweet, but if I really become choosy and only focus on the Diwali festival and mood, then Mohanthaal and Magas ( gram flour fudge ) tops the list. I just can't ignore these two for me, I cannot imagine my Diwali platter without either of these two authentic dishes. To me, the sweet aromas of roasting chickpea flour in desi ghee itself prepares me for joyous celebrations of Diwali and sweets are considered very auspicious to offer for Laxmi Poojan. The second sweet I made first time ever was Kesar, Badam, Elachi Balushahi and thank god the whole family were not disappointed at all, actually, kids asked me to keep this recipe in our Diwali menu forever :) We truly had great experience of devouring this incredibly and irresistibly sweet. And last but not least I prepared Stuffed Magas ladoo, but could not post on time as I got super busy in the Diwali preparations, so these Stuffed Magas Ladoo pictures had sat quietly in my folder almost a year, an apt time to post as the Diwali fever is right high. Magas or Magas na Ladoo is an amazing and luscious authentic Gujarati sweet which is the most loved sweet dish prepared by Gujaratis on the Diwali. Generally, this traditional Magas is prepared with roasted chickpea flour, ghee and sugar and either you shape that mixture into ladoo or set on a plate. Being a foodie myself I love little experiments here and there with my food. I jazzed up a little and stuffed the ladoo with rich and creamy pistachio filling. So here is my stuffed magas ladoo it has a twist to the regular magas ladoo with a delicious pistachio stuffing mixture. A combination of two textures and flavours are brilliant and works well in this recipe. The top layers are smooth and melt in your mouth. These ladoos with nutty and crunchy pistachio fillings are an experience for your taste buds. Lighten up this Diwali by sharing and savouring these delights with your friends and family. May the festival of light encircle your life with Joy and Happiness. 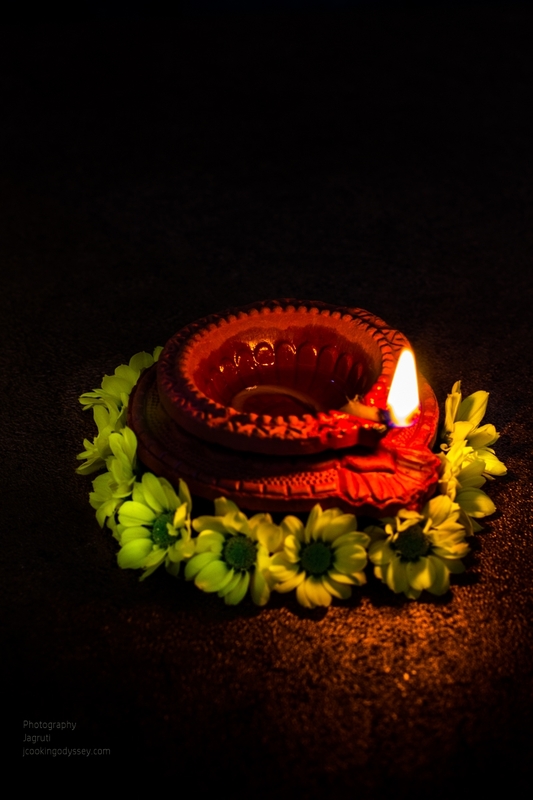 Happy Diwali...!! These Stuffed Magas Ladoos are rich, delicious and a perfect treat you can prepare for Diwali festival. Mix milk and 1tbsp. ghee, add into 250 g gram flour. Gently mix and leave it for half an hour. ( this procedure called DHABO DEVO in Gujarati )Meanwhile lightly roast the khoya in a kadai for a couple of minutes and add ground pistachios. Mix well and turn off the heat then add powder sugar and cardamom powder and mix well. Leave it aside.Sieve magas ladoo mixture through medium hole sieve so you'll get very nice crumbly textured flour. Turn off the heat, transfer mixture into another bowl.Semi-cool the mixture and add sugar, cardamom and nutmeg powder.Divide the pistachio mixture into equal parts and make into tiny marble size balls.Once magas ladoo mixture is cool enough to handle, take a small amount of the mixture and roll into a ball.Then slightly flatten the magas ladoo and put pistachio ball in the centre and roll the magas ball again making sure that pistachio ball is covered properly from all the side.Repeat this procedure with the remaining mixture. 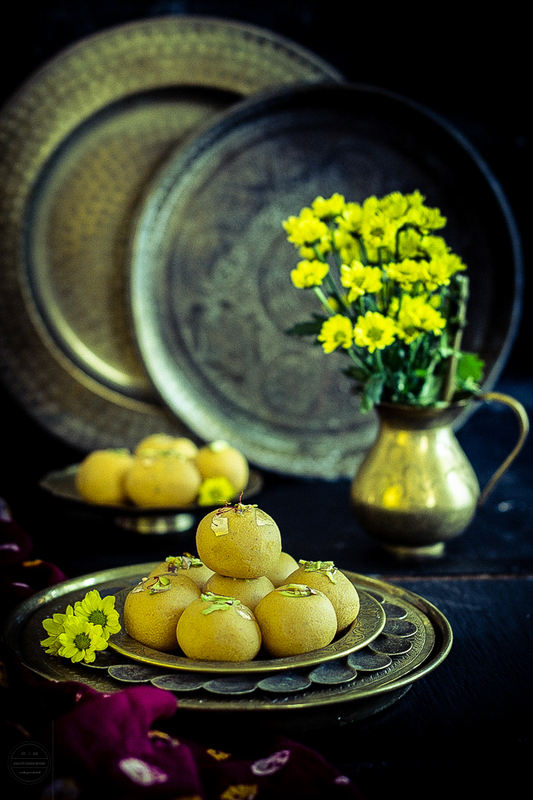 Arrange them on a serving tray and sprinkle pistachio slivers and saffron threads on top of the ladoo and stick edible gold leaf.Enjoy! This is delicious I love the ladoos. Never added milk before in my besan ladoo. Happy Diwali to you. These laddoos look scrumptious Jagruthi. LOVE that pista filling -- yumm!! Thats absolutely delicious. I am so in love with your styling the pic, esp the first one. This is one sweet we usually make for Diwali but the filling is new to me. Nice share. These look fabulous and awesome clicks!! Such a delightful and very irresisitble laddoos, prefect for any celebration. Omg I am literally drooling over the pics. Love the wonderful combination of magaz in gramfolur ladoos. You have the most beautiful photos - they make the food look so fabulous! An innovative sweet Jagruti. I can imagine these ladoos going to someone's house as engagement 'matli'... so pretty. Your clicks are so beautiful. 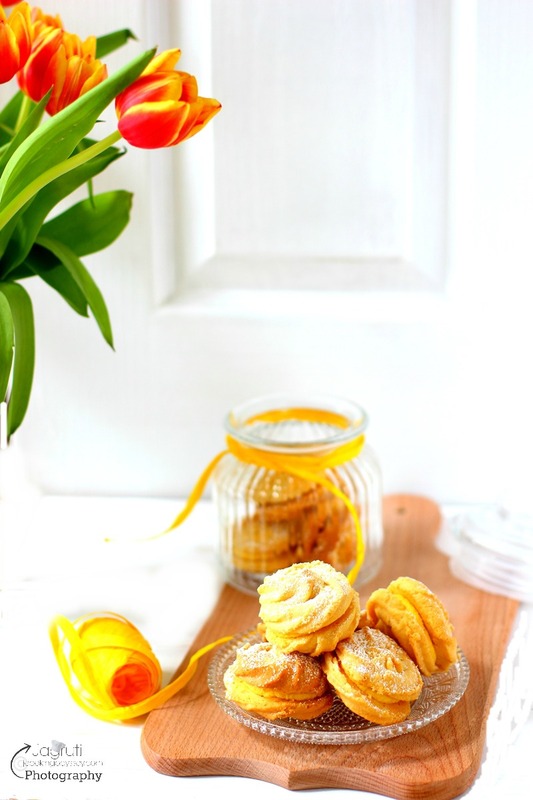 What a lovely presentation of a delicious sweet.. Love it to the core !